The place to be on Sunday afternoon, January 20, is the Artists' Quarter. I previewed the upcoming Valves Meet Slide/Sunday Afternoon Jazz Party for MinnPost and look forward to going. The AQ is such a homey and welcoming place, and this is such a great band, that you can't go wrong. "It got chosen for me. It happened at school [Graf grew up in Roseville] during an introduction-to-the-band night, when they have all the instruments out on tables for kids to go and look at. Being practical minded, I wanted to play the flute, since it was the smallest and would be easiest to carry on the bus. But the band director said--this was a while back--'Boys don't really play the flute.' My mom was with me and volunteered that I had a toy slide whistle and could play it. So I ended up with the trombone." How did he become a professional musician? "My best friend in high school was Dave Jensen [a member of the Hornheads], who was a year ahead of me. We used to hang out a lot and he had a lot of records. We'd go to as many live concerts as we could find. We were crazy about it. During college, Dave started breaking into the playing scene; in a way, I rode his coattails. There used to be a number of big bands that got together for the fun of it to read charts. I kind of just fell into it." I asked both Dave and Brad, "Do you feel the trombone is becoming more popular?" (The question came out of the fact that I'm seeing a lot of trombones lately.) Ask anyone who knows the two of them and they'll tell you Dave tends to be more talkative and Brad is a man of fewer words. Dave said: "I don’t think the trombone will ever be what you call popular. A number of players are bringing it to higher profile…Slide Hampton, a great player in his 70s who seems to get better. Steve Turre is another favorite of mine, Wycliffe Gordon, Conrad Herwig, Steve Davis.... Trombonists kind of have to make their own opportunities. It’s not the first horn people think of in a jazz band; that’s saxophone, then trumpet. 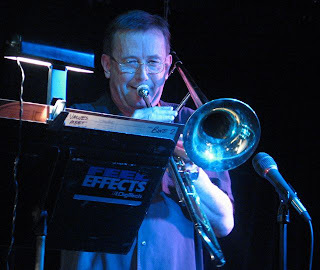 When I play with bands that use a horn section, trombone is always the first thing to be cut when they have to trim the budget." Brad said: "No, I don't have any justification for agreeing that's true." No worries; on Sunday the 20th, Brad will play just as many notes as Dave.